Why? Is there something about hot and dry that removes road surfaces? Northern folks have freeze/thaw cycles that lever out huge chunks of asphalt, but surely not where you live. ours is not to reason why...but I am sure there is a reason. Budgets shrink if the funds don't get spent. Use it or lose it. Guess I'll visit again in '19 or '20. In Kansas you can tell what county you are from by the the rock damage to your windshield. If you are from Butler county there is no point in replacing your windshield until it is so beat-up that the local sheriff officer stops you and gives you a fix-it ticket. Cause two-week later it is going to have a crack again the length of the windshield. I still have two unfixed cracks I got several years ago from my trips to the Chili Cook-off. Texas is fairly unique compared to other states in that it is one of but four that maintain all the roads. In most states - the counties maintain roads in their county and the state maintains only the roads that cross through the counties. Counties have much lower standards for maintenance because of the expense.. 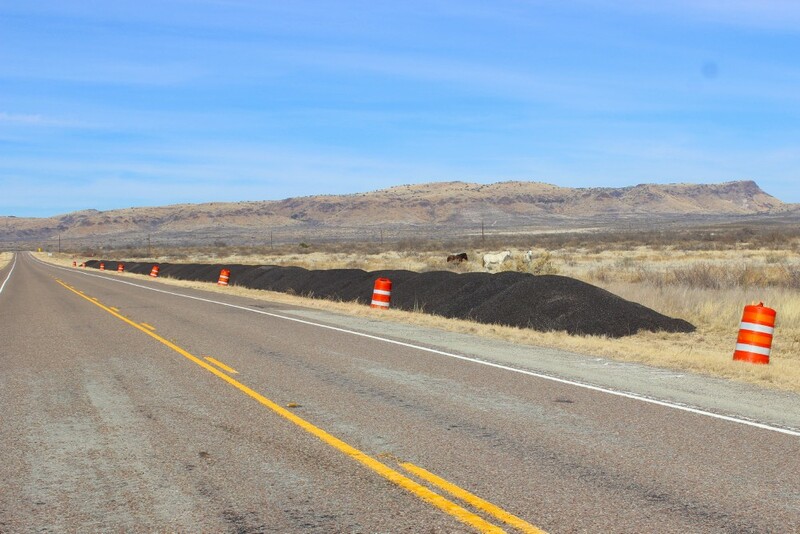 Even roads like Texas 118 are very expensive to maintain and it's the responsibility of the State which maintains roads irrespective of how many people live on an use the road. Texas has the largest road system in the US.. it's almost twice as big as the next -California. Rail opened up the west but roads opened up vast lands away from rail including Texas. Finally - imagine how things would be if Texas did not maintain 118 to even basic standards and it looked more like the road from TX 118 to John's place - all the way from Alpine to Terlingua? Don't laugh - that's pretty much how things were before Texas took over the roads in 1917 or so. High quality, well maintained roads were the original "internet" that allowed people to live beyond the cities and away from rail; land became much more accessible - and more valuable... People COULD live more self-sufficient - but they needed the roads to do that! and clearly a lifeline for John who lives "off the grid" but not off of UPS, FedEx and the Internet! Today - we all take roads pretty much for granted even as we do complain about them! Second to perhaps public education - PUBLIC (tax funded) roads were the original "make American Great".. Govt! If it's your money, I think you get to reason why. Agree on the roads, L.G., best use of taxpayer money by far. Public schools, not so much - indoctrination centers.